Why have one Chris Hemsworth when you can have two? 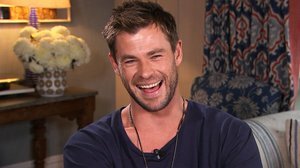 The "Avengers" star is famous for his insanely ripped body, but it's time to meet the man whose biceps rival that of the god of thunder himself – hit stunt double! Bobby Holland Hanton is a 33-year-old stuntman who has filled in for Chris on blockbusters like "Snow White and the Huntsman," "Avengers: Age of Ultron" and "Thor: Ragnarok." While Bobby has also worked with Marvel stars Chris Evans and Ryan Reynolds, he definitely looks more like a long lost Hemsworth brother. Not only do they make movie magic together, but the two hunks have become buddies off screen as well. The stuntman has documented his bromance with Chris on social media for years, naturally showing off their buff bods. "One of the best people I know…..FACT," Bobby captioned this snap. Bobby may just be the only other person mighty enough to wield Thor's hammer!